Im new to this sooo... help! 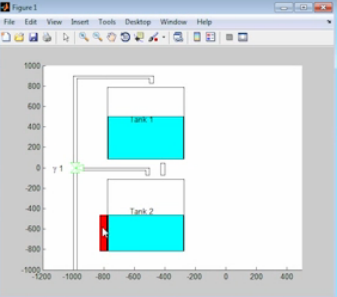 My simulink model shows the results of a tank system (2 tanks), the water levels h1 and h2. What do I have to do to make a closed-loop system out if. the bigger the h1 level the bigger the R2 flow, the same goes for the h2 and R3? It appears R1, R2, and R3 are the vales you want to control. So these or a subset of these should be controlled by a controller. 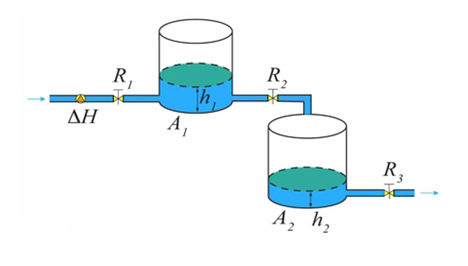 For example, take a look at a simpler, but similar example where there is an inflow valve we use to control the water level. how can I make a figure according to that picture above? I just want the fluid levels to be shown in the figure in real-time, the scope values to be shown for both tanks, something like in this picture below.